As a 7th and 8th grader in Miami’s “Roads” neighborhood, Raquel “Rocky” Rodriguez planned to become a marine biologist. Instead, she decided to pour her energy and intellect into the practice of law. But she never abandoned her love of science, with far-reaching results for the State of Florida. As general counsel for Governor Jeb Bush from 2002 to 2006, Rodriguez helped smooth the way for the establishment of The Scripps Research Institute’s scientific facility in Jupiter by conceiving and co-drafting the enabling legislation and negotiating a $310 million economic incentive grant. Rodriguez’s solution was to create a non-profit Scripps Florida Funding Corporation with board members appointed by the governor, House speaker and Senate president. The Governor’s Office of Trade, Tourism and Economic Development then signed a funding agreement with the nonprofit, which would hold the funds, monitor Scripps’ performance and disburse funds based on certain milestones. “Everyone was happy with that arrangement, and we were able to negotiate the material terms of the agreement in advance of the Scripps special session to ensure that the legislation and the business terms aligned with each other,” Rodriguez says. That nonprofit structure became the template for the state’s 2006 incentives that brought Sanford-Burnham Medical Research Institute to Orlando, Torrey Pines Institute for Molecular Studies to Port St. Lucie and Stanford Research Institute to St. Petersburg, as well as others in later years. Law is a family tradition for Rodriguez, who was born in Miami Beach to Cuban political exile parents. Her father Roberto was a lawyer who had been one of the youngest representatives ever elected to Cuba’s Congress in the early 1950s. After Castro’s takeover in 1959, her father sought asylum in the Honduran embassy, and was eventually reunited with her mother in Miami. Rodriguez’s mother, Raquel, was a homemaker who later became an acclaimed poet, publishing several well-received books of poetry. Rodriguez also became active in regional, state and national legal organizations, and was elected chair of the American Bar Association’s Young Lawyers Division, helping her build a nationwide and global professional network. One of her ABA friends introduced Rodriguez to Multilaw, a London-based global association serving member law firms from all over the world. Rodriguez was hired as executive director and served for two years, traveling the world and commuting between Miami and London. She returned to Miami in 1999 to support her father in caring for her mother, who was diagnosed with Alzheimer’s disease and passed away in 2001. She rejoined Greenberg Traurig, and became involved with George W. Bush’s 2000 presidential campaign, as one of the lead lawyers for the Republican Party in Miami-Dade County during the post-election recount battle. In 2002, Rodriguez was recruited to serve as Bush’s general counsel, and relocated to Tallahassee but commuted frequently to Miami. After the end of the governor’s term in 2007, she joined McDermott Will & Emery as a partner, and returned to private practice. 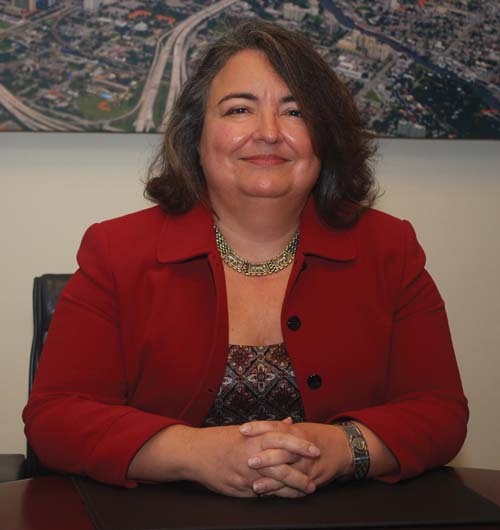 In 2011, she opened the Miami office for Cleveland-based McDonald Hopkins, reuniting with her former Greenberg Traurig colleague John Metzger, who had opened the firm’s West Palm Beach office in 2004. When Rodriguez is not busy with her practice or managing the office, she enjoys baseball and follows the Miami Marlins. She also likes to spend time on the beach, traveling and reading history books like “Empire of the Summer Moon,” an account of how the Comanches were defeated in the American west, a gift from one of the scientists at a client institute. Today, Rodriguez focuses her practice on three areas: litigation, including election law; government affairs, primarily related to economic development; and outside general counsel work. She has advised clients involved in disputes or transactions involving Latin America, and counseled clients with respect to the Foreign Corrupt Practices Act, the USA Patriot Act and Inter-American Bank anti-corruption investigations. She’s also stayed true to her roots, working closely with clients in the life sciences sector. She helped the Max Planck Society obtain nearly $200 million in state and local incentives for its Florida institute in Jupiter, and handled many aspects of the transaction. She also negotiated a terms of grant agreement for $60 million in state incentives for the establishment of Oregon Health and Science University Vaccine & Gene Therapy Institute Florida Corp. (now VGTI Florida) in Port St. Lucie, and continues to advise clients in this dynamic sector. Her mother’s experience with Alzheimer’s at a time when little was known about the disease and her father’s recent death from pancreatic cancer underpin Rodriguez’s ongoing commitment to life sciences. She serves on the board of directors of BioFlorida and its executive committee, also co-chairing the government affairs committee.